The current team of HI-SEAS crew members, with UH Manoa's Brian Shiro (left). On the evening of Wednesday, October 15, 2014, Hawai'i Space Exploration Analog and Simulation (HI-SEAS) team members closed the door to their faux Mars habitat and shut out the rest of life on Earth. In so doing, they stepped into uncharted territory—beginning an eight-month investigation into the human factors that contribute to astronaut crew function and performance over time. Although numerous space analog studies have been conducted over the years, this is the longest U.S. study to-date. Worldwide, only the Mars500 study in Russia during 2010-2011 surpasses this one in total duration. The current study led by the University of Hawai'i at Mānoa is the second in a three-part series funded by the NASA Human Research Program. "We need to know more about how the mind works, how individuals contribute to a team, and how that team dynamic changes over time in order to anticipate how astronauts will react during long-duration space travel," said UH Mānoa Associate Professor Kim Binsted, principal investigator for the program. "It's essential that we understand these factors before we start assembling a team for a manned mission to Mars." 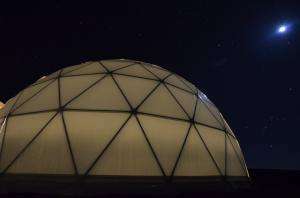 The HI-SEAS habitat by moonlight. Photo by Sian Proctor. NASA has stated that a manned mission to Mars is possible by the 2030s. Recently certain private and nonprofit organizations have stepped up to try to accelerate this schedule. For example, Mars One, a nonprofit based in the Netherlands, has put forward conceptual plans to establish a permanent human colony on Mars by 2025. 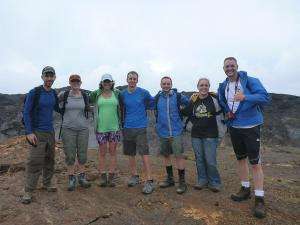 For their part, the six crew members of the current HI-SEAS study spent their last day on Earth packing their bags, enjoying local Hawaiian foods like loco moco and kalua pork, and making phone calls to their friends and loved ones. Certain participants took advantage of their last free morning to book a helicopter sightseeing tour over the active Big Island lava flows. Crew members from a previous HI-SEAS mission outside of the habitat. Photo by Ross Lockwood. Their view will be much more limited over the next eight months. The HI-SEAS habitat site at about 8,000 feet on Mauna Loa has just one small porthole window looking out toward Maunakea. 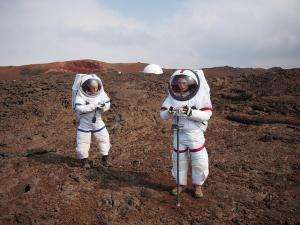 Simulated space walks or "extravehicular activities" (EVAs) will provide crew members with a chance to experience the outdoors, but only while wearing bulky simulated space suits. Email communications with the outside world will be subject to a 40-minute delay to simulate how long it takes for a message to get from Earth to Mars and vice versa. As the crew members (read crew bios here) go about their daily activities inside the HI-SEAS habitat, UH Mānoa researchers and their collaborators will be studying the team's cohesion over time, gathering data on a wide range of cognitive, social and emotional factors that may impact performance. The crew members will be continuously monitored using biometric trackers, electronic surveys, and other surveillance methods. More information: The public is invited to follow along with videos, researcher blogs, and photos featured at hi-seas.org/ or on Twitter (@HI_SEAS) or Facebook.